Much of the existing work in machine learning and data mining has relied on devising efficient techniques to build accurate models from the data. Research on how the accuracyof a model changes as a function of dynamic updates to the databases is very limited. In this work we show that extracting this information: knowing which aspects of the model are changing; and how theyare changing as a function of data updates; can be verye effective for interactive data mining purposes (where response time is often more important than model qualityas long as model qualityi s not too far off the best (exact) model. 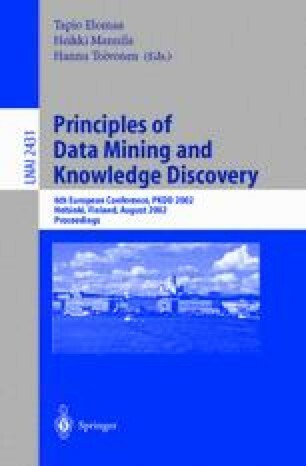 In this paper we consider the problem of generating approximate models within the context of association mining, a keyda ta mining task. We propose a new approach to incrementallyg enerate approximate models of associations in evolving databases. Our approach is able to detect how patterns evolve over time (an interesting result in its own right), and uses this information in generating approximate models with high accuracy at a fraction of the cost (of generating the exact model). Extensive experimental evaluation on real databases demonstrates the effectiveness and advantages of the proposed approach.